I Buy Way Too Many Records Dot Com: Against Me - The Daytrotter Sessions 7"
This was released for the yearly Black Friday Record Store Day from this past year. I never really understood the Black Friday one. It always seems to me like the very worst of Record Store Day without the handful of cool records that make it tolerable. This was literally the only thing I had any interest at all and I just ordered it online after the fact. Like Black Friday's Record Store Day, this 7" is kind of pointless as well. This is the very definition of a collection filler to me. 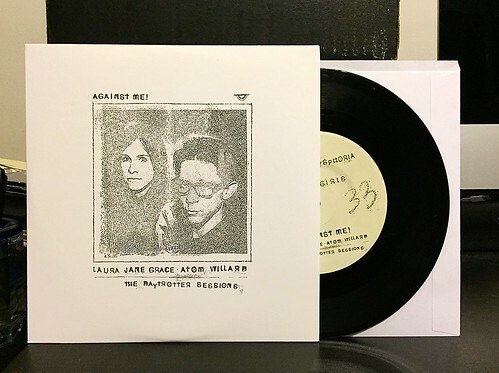 I like Against Me quite a bit, I have all of their LPs and every one of their 7"s. So, I did feel to keep the collection complete I should pick this up as well. I can't imagine ever listening to it again though. It's 4 of their previously available songs. "500 Years," "Transgender Dysphoria Blues" and "Pretty Girls" are done using an electric guitar, but played as if they were slowed down acoustic songs with minimal accompaniment from Atom Willard of Drums. "Two Coffins" is actually played on an acoustic guitar. I guess they're kind of interesting takes on the songs and I don't think it's wrong of them to document this with a 7" or anything like that. I'm sure some people will be excited that this is available to own. But for me, I just don't really care that much. Maybe if there was one unreleased song or something. But honestly, the only radio sessions I want to see on vinyl at this point are those first three Beck at KCRW sessions. That's some radio gold right there. I agree with the Black Friday deal. I don't get it. It was sad to see the local record store really stock up on the vinyl offered and then still having lots left over months afterwards. I'm talking stacks of vinyl from the event. Scary.